School days dwindling to a year's end bring the thrill of freedom and days of playing in the sun for children but can bring a sense of dread to parents. How can you keep your children entertained and happy during the months before school starts back up? Families who have children with special healthcare needs have the added worry of finding a camp that will support their child's specific condition. 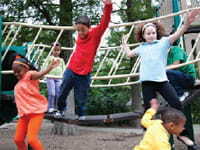 The Cincinnati Children’s ADHD Summer Treatment Program (STP) is a 7-week intensive summer day treatment program for children with ADHD ages 7-12 providing comprehensive behavioral interventions within a camp-like setting. Read more. Hem/Onc Kids Camp is available to families of the Cancer and Blood Diseases Institute at Cincinnati Children's. Read more. Camp Korelitz is supported by the Division of Endocrinology at Cincinnati Children’s. For more information contact Erin Crosby, erin.crosby@diabetes.org, 513-759-9300. Camp CouragEOS is available to families of the Cincinnati Center for Eosinophilic Disorders (CCED) at Cincinnati Children's. Read More. Camp Joyful Hearts is supported by the Heart Institute at Cincinnati Children’s. Read more. Camp Wekandu is supported by the Division of Rheumatology at Cincinnati Children’s. Read more. The Tuberous Sclerosis Summer Camp is supported by the Tuberous Sclerosis Clinic at Cincinnati Children’s. Read more. The Special Needs Resource Directory can help you find additional local and national camps that accept and provide supports for children with other special health care or developmental conditions.